Senior judges are a vital judicial resource. When judicial workload exceeds capacity and the need for new judges is not addressed by the legislature—as has been the case since at least 2007—senior judges significantly improve the services that Florida’s courts are able to provide citizens. They are far less expensive to taxpayers than creating new full-time judgeships. Thus, they are crucial to help resolve the state courts system's growing number of legal cases. have better and speedier access to courts. mitigates interruptions that are caused when judicial offices are vacant or when active judges are unable to serve because of illness or other reasons. Their service is especially crucial in times of budget austerity. For instance, they played a critical role in helping the branch address the formidable mortgage foreclosure backlog that hit at the height of a deep economic recession starting in 2008 that reduced tax revenues and forced state government to slash its budget. The chief justice of the Florida Supreme Court has “the power to assign justices or judges, including consenting retired justices or judges, to temporary duty in any court for which the judge is qualified.” The chief justice also has the authority “to delegate to a chief judge of a judicial circuit court the power to assign judges for duty within that circuit” (Article V, section 2(b), Florida Constitution). The judges or justices who are assigned to temporary judicial duty are known as senior judges. 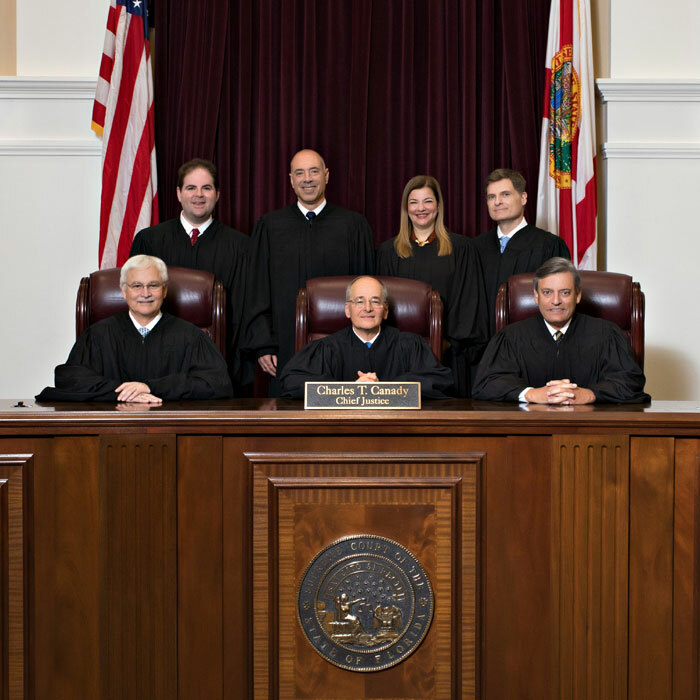 Most Supreme Court documents about the appointment of senior judges are public records under the Florida Rules of Court. To request records about senior judges, members of the public or the press should send a written request by email to the Public Information Office of the Florida Supreme Court at publicinformation@flcourts.org. Requests cannot be made by telephone because Florida Rule of Judicial Administration 2.420 requires that all requests be in writing for purposes of state record keeping. To become a senior judge requires some effort and planning. Three months before retirement, judges who want to become senior judges must submit a letter notifying the Chief Justice of their retirement and of their interest in serving as a senior judge. They are then given two forms to complete. The Consent to be Assigned to Judicial Service form requests factual information (e.g., about the court from which they are retiring) and inquires into their willingness to abide by certain requirements (e.g., earning continuing judicial education credits, refraining from the practice of law). The Judicial Questionnaire seeks information about their docket preference and their willingness to travel outside their own circuit; it also asks them to provide the names of five attorneys who have appeared before them within the prior three months. After the supreme court receives these forms, it sends an inquiry to the Judicial Qualifications Commission to find out if any disciplinary action has been taken against those aspiring to become senior judges. In addition, their chief judges are asked to comment on their ability to serve. Once the various inquiries have been satisfied, the supreme court considers each application. If the application is approved, the judge’s name is placed in a database that chief judges use to assign senior judges. Clearly, both Florida’s judicial system and the people of Florida benefit from the service of these competent, experienced jurists. DOWNLOAD THE PACKET: Click on what you need. Note: #1 and #2 are the same document and these can be completed on your computer and sent via email by clicking on SUBMIT button on the last page. If you would like a copy for your records, print the document before you submit. Adobe Acrobat Reader is required in order to fully utilize the functionality contained within the Consent to be Assigned to Judicial Service Form. Please download and install this free application, if you have not already done so. Senior Judge loyalty Oath - print, sign, notarize and mail. Form W-4 - with fillable form fields to complete, print, sign, and mail. For additional information, contact publicinformation@flcourts.org.